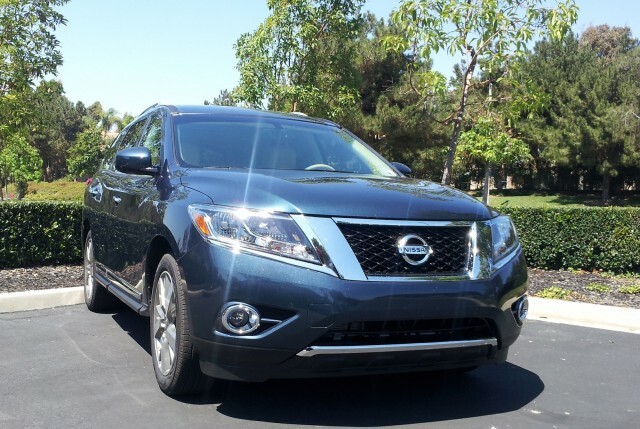 2014 Nissan Pathfinder Hybrid: Is It Hybrid Enough To Matter? Last year, we drove a prototype Infiniti JX Hybrid, as it was then called (it's now in production as the 2014 Infiniti QX60 Hybrid). At that point, we wondered whether its mild-hybrid system would be "hybrid enough" to compete against the Lexus RX 450h that spawned the hybrid crossover segment two generations ago. Now we've driven the 2014 Nissan Pathfinder Hybrid, which uses the same system, and the question is even stronger in our minds: Is it hybrid enough to matter? 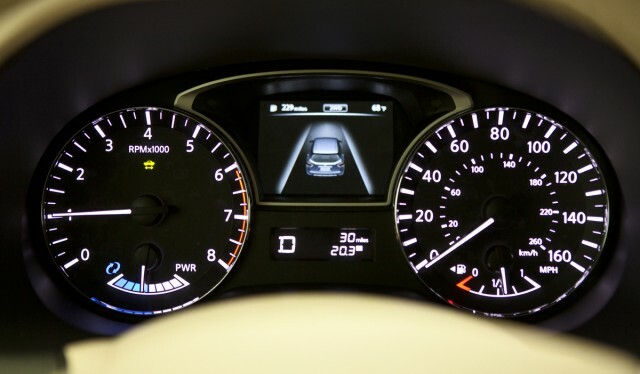 To recap, the new-for-2014 Pathfinder Hybrid replaces the standard 260-horsepower, 3.5-liter V-6 engine and continuously variable transmission (CVT) with a supercharged 2.5-liter four-cylinder engine that sandwiches a 15-kilowatt (22-hp) electric motor between the engine and CVT, with a clutch on either end. Power output from the combined new system is 250 hp, just 10 hp less than that of the V-6. The hybrid Pathfinder is rated at 26 mpg combined (25 mpg city, with highway ratings of 27 or 28 mpg for all-wheel or front-wheel drive, respectively). The improvement in gas mileage is 18 to 24 percent: Ratings are 22 mpg for the front-wheel-drive Pathfinder, or 21 mpg for the all-wheel-drive option, when fitted with the standard V-6 engine. We haven't yet had a chance to do our usual road test on a Pathfinder Hybrid, but we were able to drive one for about 20 miles in Southern California earlier this year. And the driving experience just confirmed our impressions from the prototype: This is a basic mild-hybrid system, meaning it has virtually no ability to move this big, heavy crossover on electric power alone. Instead, like the IMA hybrid system Honda uses in some of its smallest cars, the Nissan system uses the electric motor to provide torque that supplements that of the engine, recharge the lithium-ion battery pack under regenerative braking, and restart the engine when it switches off after the car stops. We look forward to a test drive of the car to determine whether these observations are borne out over a longer period of more varied use. It's worth noting, though, that Nissan is pricing its hybrid Pathfinder aggressively: It undercuts the 2013 Toyota Highlander Hybrid by roughly $4,000 for comparable all-wheel-drive models. That seven-seat 2013 Highlander Hybrid will be replaced by an updated model for 2014, so we don't know what the gas-mileage ratings will be. The 2013 hybrid Highlander is rated at 28 mpg combined (28 mpg city and highway too). 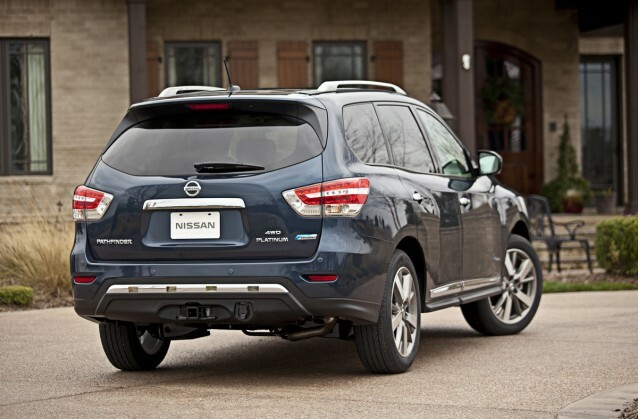 Pricing for the 2014 Nissan Pathfinder Hybrid starts at $35,970; that'll get you a hybrid front-wheel drive Pathfinder SV. You can climb all the way up the price chart to $45,210 for the all-wheel-drive Pathfinder Platinum Hybrid. The middle of the range, and what may be the most popular model, is the Pathfinder SL Hybrid--which starts at $38,910 with FWD or $40,510 with AWD. Ultimately, the sales charts will tell us what's more important in a hybrid seven-seat crossover: all-electric running, or simply the "Hybrid" label and gas mileage in the mid-20s or better. Nissan provided airfare, lodging, and meals so High Gear Media could attend the global Nissan 360 event and bring you this first-person report.